Check out the "Topping Things Off" section in our A5 review for a full assessment of the S5 soft-top versus its hardtop competition. The top powers up and down in less than 20 seconds, while the G37 and Volvo C70 each take 30 seconds. Like the hardtops, it requires no latches to secure or undo. 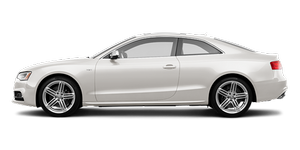 Another major plus: The S5's trunk loses only about a quarter of its 10.2 cubic feet when the top is folded. (Audi doesn't have specific figures for trunk intrusion, so I eyeballed it.) Folding hardtops, in comparison, are large contraptions that take up, at minimum, half their trunk's space — and often much more. Such are the inherent advantages of a soft-top. Consider, for example, that Mercedes-Benz says the soft-top on its 2011 E350 convertible takes 20 seconds to raise or lower, and it takes up less than one-fourth of the trunk's 13.8 cubic feet. On the downside, wind noise in the S5 starts to creep up by 60 mph or so. Generally speaking, hardtops are as quiet inside as coupes. Also, if you like the spectacle of a folding hardtop in action — even a dozen years after seeing the first Mercedes SLK, I'll admit it's still kind of neat — the S5's soft-top just won't do.